My boys’ fascination with weapons has all but passed. At the ages of 19, 16, 14 and 11, they’re not much interested in guns (real or pretend – save for the occasional Nerf battle), and the lightsabers that once saw so much action are collecting dust in the toy bin. But a few years ago, one corner of my toy room was very nearly an arsenal, and you could hardly walk from one room to another without tripping over a plastic gun, sword or saber. I never expected to amass such a collection of toy weapons. In fact, I was a aiming for a “no gun” household. Like many parents (especially moms), I was leery of weapons play, and acutely aware of the dangers of firearms. I worried that boys’ fascination with weapons might somehow turn dark and dangerous, and saw no benefit to boys whacking at one another with wooden or plastic swords. Someone could get hurt! Then I had four boys, and my boys, like so many others before and after them, developed a magnetic attraction to weapons. 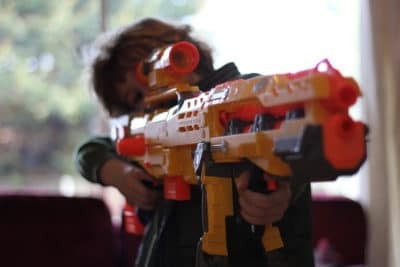 Despite my prohibitions on toy weaponry, and the fact that we kept our TV tuned to kid-friendly programming while the children were around, our boys chewed toast into tiny guns. Staged elaborate battles. And pretended to fight and kill one another. That’s normal, their dad told me. I wasn’t so sure, but I was quickly beginning to see the futility of a weapons ban. I realized that I could exert a lot of time and energy into trying to uphold the ban – or I could relax and observe my kids’ play. I chose the latter. Instead of interfering in my boys’ weapons play, I let it continue. I set (and enforced) some basic ground rules, of course – hitting people in the head was strictly verboten – but otherwise let them play. I’m so glad I did. Research into weapons play has shown it to be a very nearly universal experience for human boys. Boys’ fascination with weapons, researchers have concluded, is very normal and natural, and likely due to a combination of biology and socialization. Furthermore, weapons play does not increase the likelihood of real-life violence or aggression. Quite the contrary: boys seem to use weapons play as a way to experiment with power and dominance, to try on various roles and negotiate imaginary challenges. Banning weapons play can also lead to dishonestly; when boys’ deep desires are thwarted, they typically find a way to fulfill them in secret. Overt bans or a panicked response to a young boys’ curiosity about weapons also sends the not-so-subtle message that his interests aren’t welcomed or valued. Encourage target practice. Don’t like the idea of your boys pointing guns, even pretend ones, at other humans? Help them create targets and shooting challenges. Boys love to compete and demonstrate their prowess. Teach boys to stop weapons play if anyone expressed discomfort. I’ve talked to my boys about the fact that not everyone is comfortable with weapons play. If anyone is uncomfortable with their play, they know to stop and move their play elsewhere. How do you handle weapons play?